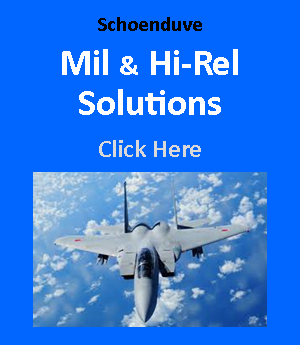 RF / Microwave Solutions . . .
Schoenduve Corporation has been offering Technical Sales Representation to Northern California and Northern Nevada Customers since 1986. This Schoenduve RF and Microwave website focuses on the Quality suppliers from all over the world we currently represent in this marketplace. Schoenduve Corporation also has dedicated websites for the following markets: Low Energy/Wearables (Internet -of-Things), Signal Integrity (SI), Military/Hi-Rel and Space. ATC - American Technical Ceramics - ceramic chip capacitors, multi-layer capacitors, single layer capacitors, thin film hybrid circuits, LCP, bias-T's, DC Blocks, Equalizers, coil woind inductors, coil wound SMT conical inductors, chip resistors, high power resistors. Performance to 40 GHz with low ESR. Exelis - A premier supplier offering a high performance RF Direct Digital Synthesizer and RF Waveform Generator with state-of-the-art specifications. Q-Tech - One stop shop for frequency sources. Q-Tech Oscillators include high performance and low noise OCXO, MCXO, VCXO, Class-B TCXO, High Shock Crystal Oscillators, Sinewave Crystal Oscillators, Real Time Clock Oscillators, and Mil-PRF-55310 QPL Oscillators. Radiocrafts - provides a turn-key WiFi Module solution for 802.15.4, including ZigBee. Demo Kits are available. Schoenduve Corporation is the USA distributor for Radiocrafts WiFi Modules and products. RTX - Off-the-shelf 802.11 b/g/n WiFi Modules as well as custom designed RF Radio Modules and Product Development Services.